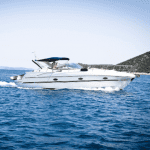 How to protect the equipment on your pontoon console? 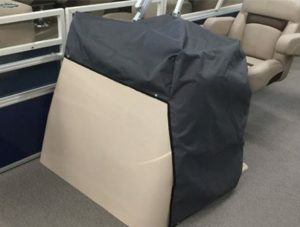 Although your pontoon console may be able to withstand elements to a certain degree, we recommend adding a cover to provide the ultimate protection. Electronics, although weather proofed by the manufacturer, always work much better when they haven’t been drenched during a downpour! Installing the cover will be so simple for you with the snaps that are included in this cover. It also comes with detailed instructions for adding the screw studs to your console. When I heard about Carver making this accessory cover, I was thrilled. I take pride in taking care of my pontoon. There is nothing better than enjoying days out on the lake. Although full covers are great, it isn’t something that I plan to install day to day during the summer. Added protection for the center console was nice during summer rains. It takes about 2 minutes to put on. (Honestly, maybe not even that long.) That may include removing it from the storage location. When I remove the cover it takes about 30 seconds to unsnap and fold away. The snaps are great. I felt that it would stay secured while I was away. I like to have the peace of mind knowing that my console equipment is safe. And, it gets even better! Carver offered this pontoon console cover in all fabrics and colors. 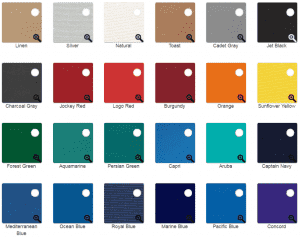 So if you have the Sunbrella Logo Red for your bimini top and full cover, you can add this in the same color. Or if you have multiple colors such as navy and tan on your pontoon, you can switch it up. Maybe you have a full tan cover but would like a navy console cover. The possibilities are endless! Have fun with it.